This course covers all essential topics for the MRCS (Membership of the Royal College of Surgeons) Part A exam. 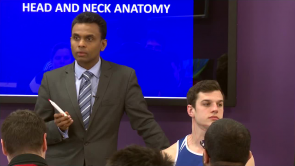 Dr. Stuart Enoch uses a combination of oral examination, interactive discussions and sample patients with symptoms to give you an overview of clinical anatomy, surgery principles and physiological principles to prepare you for your exam. The course is up to date with the current curriculum. Raise your test scores with the help of exploratory videos, clinical pearls, further downloadable materials, interactive quizzes and mnemonics. Dr Enoch undertook surgical training from the University Hospitals of Manchester and passed the exams to obtain membership (MRCS) from the Royal College of Surgeons of England and Edinburgh. After completing a PhD in Cell Biology from the University of Cardiff as well as a Postgraduate Certificate in Medical Sciences from the University of Liverpool, he pursued Specialist Training in Burns and Plastic Surgery. Whilst working as a Specialist Registrar in Plastic Surgery, Dr Enoch founded Doctors Academy and soon established the Doctors Academy Group of Educational Establishments. In addition to clinical work, he has been actively involved in medical education, teaching and training throughout his career. He has won numerous awards, prizes, research fellowships and co-chairs global events such as the International Medical Summer School and International Academic and Research Conference in Manchester. He has convened and directed more than 300 postgraduate and undergraduate educational events, presented/given lectures in excess of 50 national/international conferences/meetings, published 70+ articles in international scientific and medical journals and authored/edited 20 books. Clear and precise information on important structures of neck. Easy to remember! i would like to see much more time and effort put in the course , the lecturer is excellent but it is like he didn't have time to say all what he wanted. I think the information was skimmed too much.